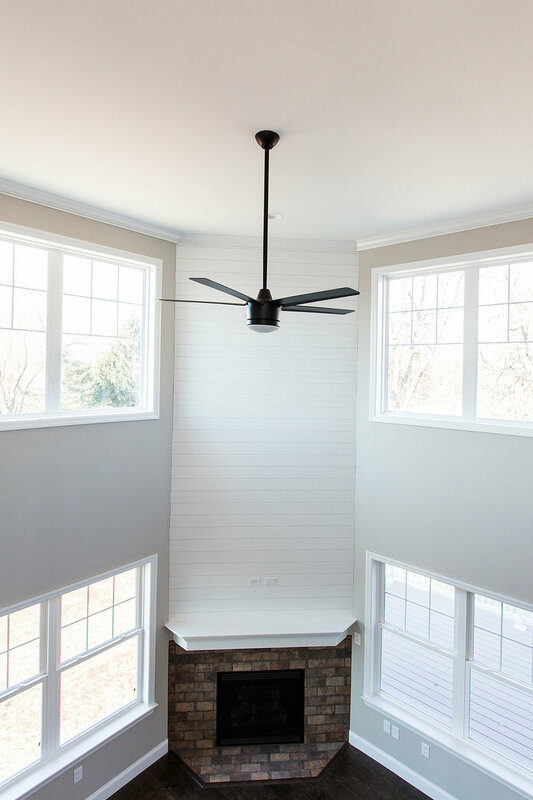 At Brentwood Builders, we have the opportunity to build our designs around concepts presented by our customers, and also create custom models of our own. This home, located in Hepplelwhite Esates | York, PA, was just completed and is currently on the market! 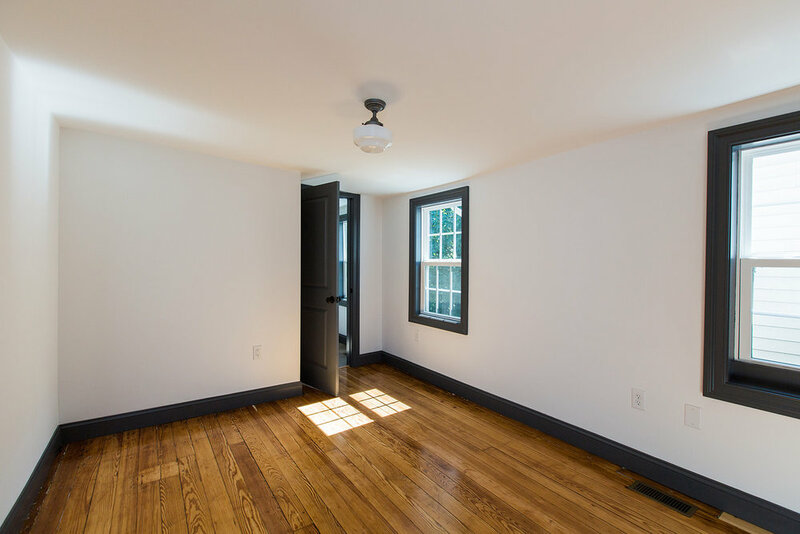 Upon entering this 3,200 square foot home you walk into a spacious hallway with hardwood floors. The den to your left is showcased by two craftsman style french doors. 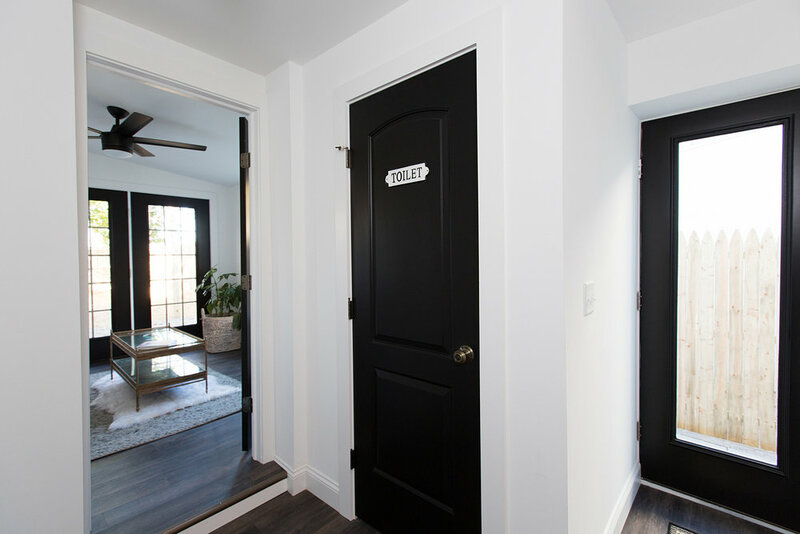 The doors throughout the home are painted an accent color to make them pop. 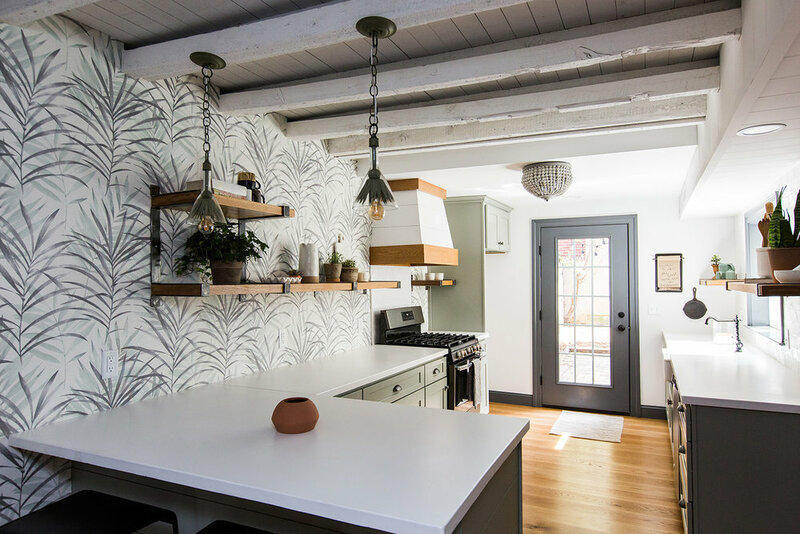 The wall color throughout the home is Revere Pewter by Benjamin Moore. A large picture window allows light to pour into the spacious dining room. 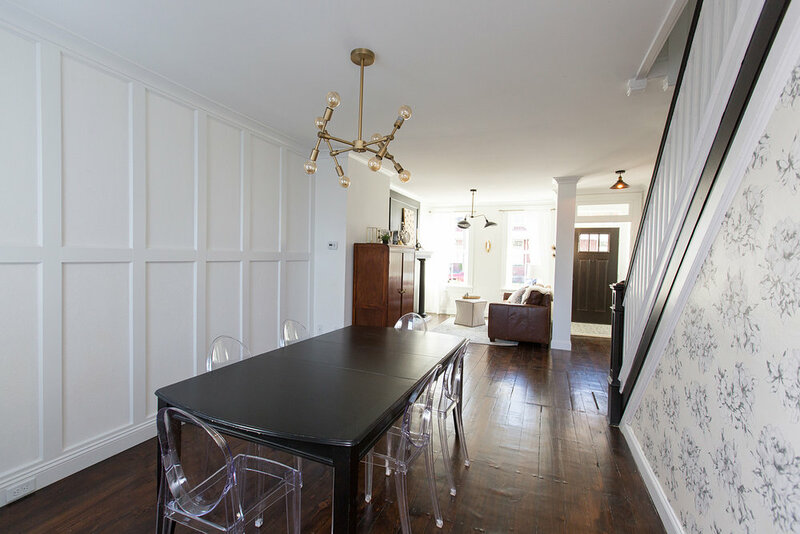 Craftsman style wainscoting wraps the lower half of the walls, creating a more formal feel. 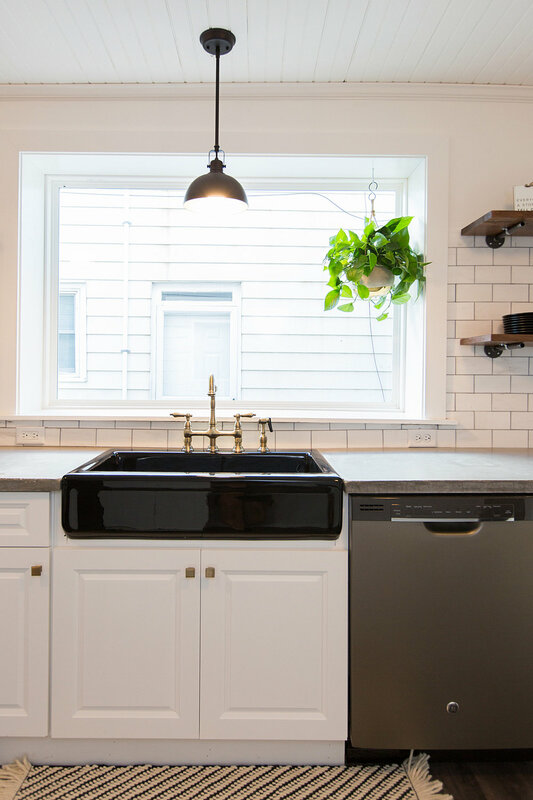 The open kitchen features white painted cabinets that run to the ceiling, Slate appliances, subway tile backsplash and a unique black granite for the counters. 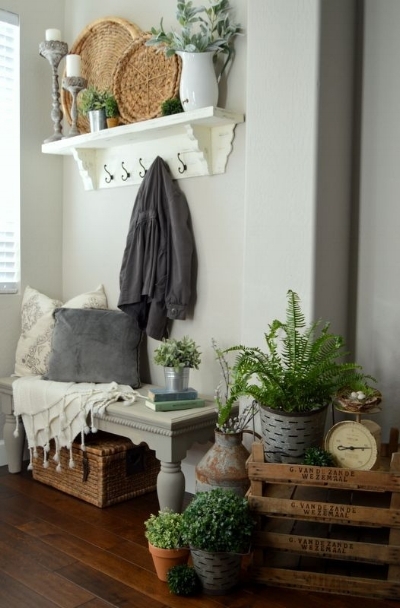 Custom nooks like this mudroom/organization station can be found throughout the home. 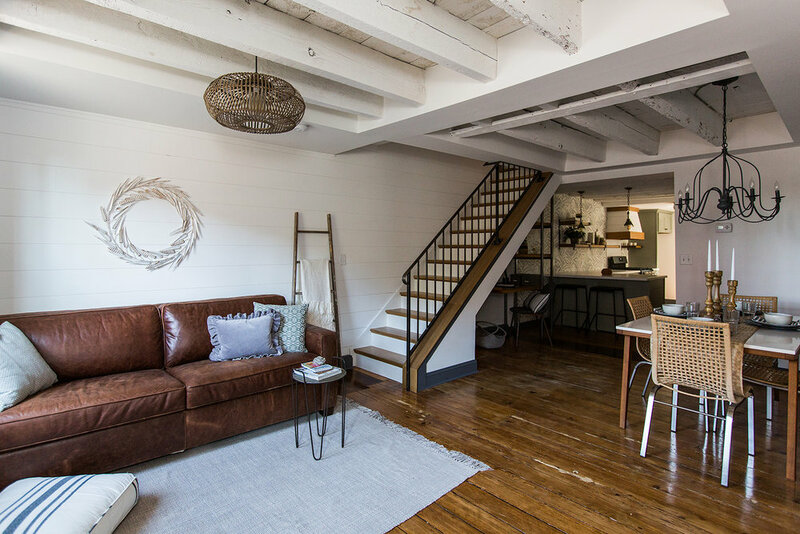 The living room area features a 17 foot ceiling and your eyes are immediately drawn to the brick fireplace accented with white shiplap. 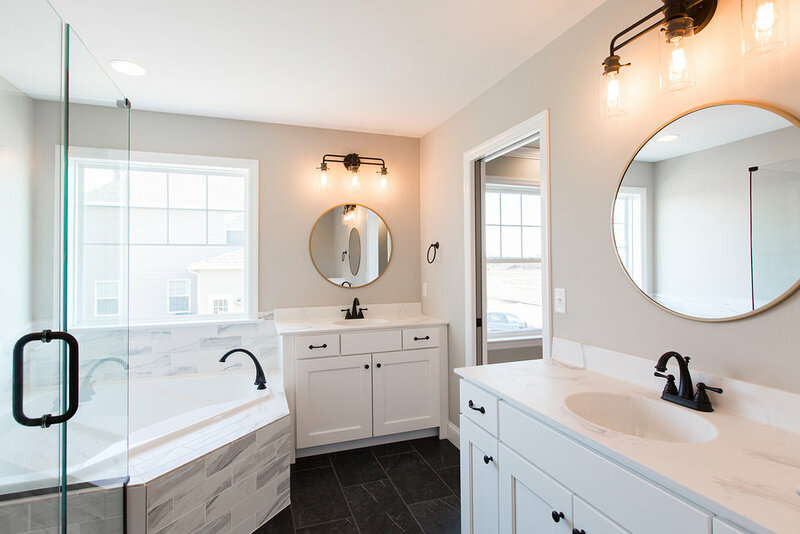 Last but not least, another favorite room in the house is the master bath. Inspired by marble and slate, this spacious bathroom is filled with natural light and feels luxurious. For more information on the details of this home, or to schedule a showing call the Brentwood Builders offices | 717-397-9350 or e-mail brent2bwb@gmail.com. When this client came to us with the vision for his home, we could not wait to see it come together! The setting, located in the West Chester area, is a true retreat, nestled away from the main road in the middle of a wooded lot. The deep blue-gray hardy plank chosen for the exterior gives a restful feel and complements the rustic stone accents. A front porch made of mahogany-style boards lines the length of the home, and offers the perfect spot for a morning cup of coffee. The homeowner chose to continue the authentic cabin feel throughout the interior, with multiple stone walls, random-width hickory hardwood, and stained wood trim. A barn beam mantle is set as the focal point of a stone fireplace in the living room. We invite you to take a tour of this cozy cabin in the woods! We are thrilled to announce that Rockford Homes, a subsidiary of Brentwood Builders, is the recipient of the 2016 Parade of Homes Fulton Award for best townhome! Located at 1291 Fieldstone Drive, Mount Joy, this townhome, labeled Number 37 in the 2016 Parade of Homes, is part of a group built by Brentwood/Rockford in the Villas at Elm Tree community. The home is 2,400 square feet, with three bedrooms and three baths, and priced at $339,950. Special interior features include a kitchen with quartz countertops, tile backsplash and upgraded appliances, an open floor plan with a rustic modern style, first floor master suite with custom master bath, and a stacked stone fireplace in the living room with an open loft area above. The parade runs June 11-19th. Weekday hours are 5-8PM, and weekends are Noon-6PM. Please stop by and take a walk through our home! We would love to see you there! 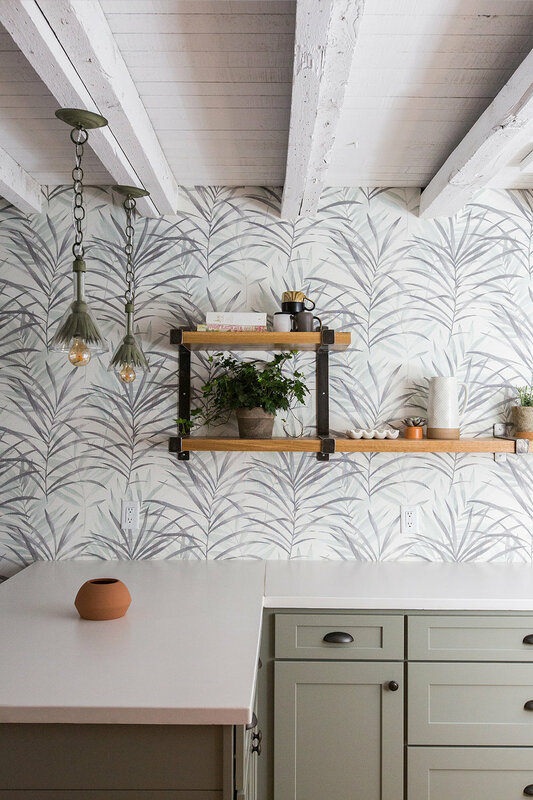 With warmer weather setting in, chances are you've probably started removing any traces of winter from your home, and making room for Spring decor. In the midst of all this rearranging that I can only assume (based on my own experiences) is going on, you may uncover dust and dirt you'd rather not face. Whoever created the "Spring cleaning" concept was truly onto something, and it really does feel good. When it's done. 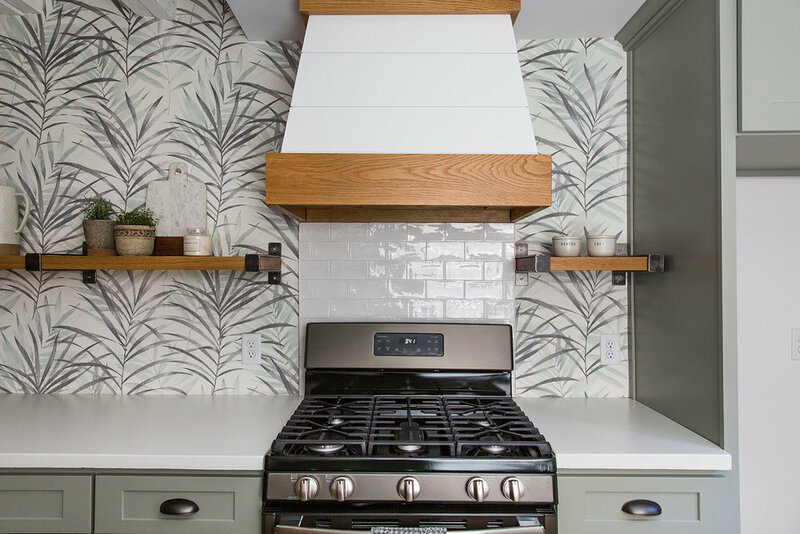 In order to prepare your home for Spring, and tackle the cleaning without feeling totally overwhelmed, we want to share a couple tips to help your prep feel more enjoyable, productive, and hopefully even a little bit inspiring! 1. Goodwill Pile, Required: First things first, you will never be able to deep clean until you move all the junk in your way, and nothing feels more cleansing then just getting rid of things! Make three piles, Store, Goodwill, Trash. Your Store pile will be the things you want to box up for next year (winter themed tea towels, accessories, pillows, etc.). Goodwill is anything that is still in decent condition but you know you either a) don't need or b) won't like next year. Saving these items "in case" is really just collecting more junk you'll end up throwing out someday anyway. Which brings me to the junk pile, pretty self explanatory. 2. Treat Yourself (to new cleaning supplies): Now that you've trashed all the excess stuff, you should be looking at a lot of empty, dusty space. 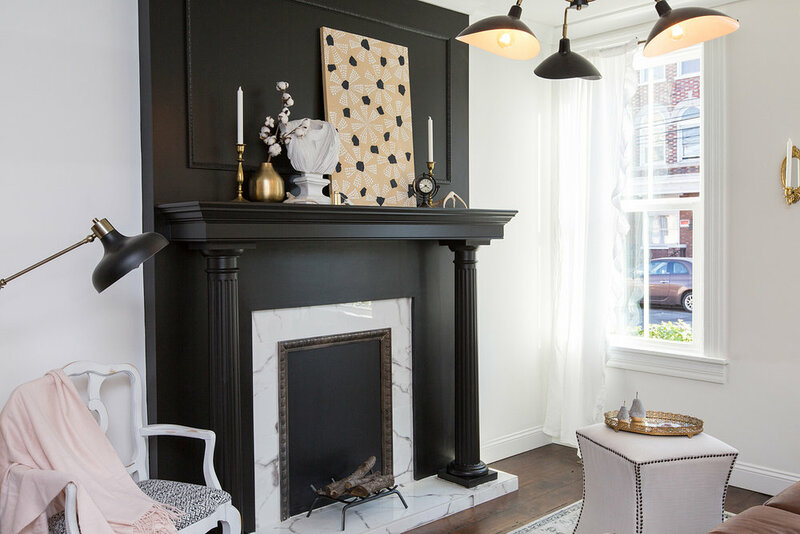 Spring cleaning really is the perfect time to tackle mantles, decorative shelves, side tables, etc. since chances are you have de-decorated them to the bare minimum. In order to make cleaning more fun, head to Target for a couple new sprays and scrubs in scents you like. It really is the little things that make life (cleaning) sweeter. 3. Candles Make Everything Better: While you're cleaning, burn candles, diffuse oils, anything to bring a fresh scent to your space. On pretty days, open the windows! A fresh smelling, aired out home is the epitome of SPRING! 4. Go Green: Thinking through Spring decor? It's as simple as a trip to the greenhouse. Live plants are timeless (as long as you water them), and live green goes with everything. 5. Treat Yourself (for real): Grab a coffee on your Target cleaning supplies run, take a quick lunch break at Tropical Smoothie, bake cookies to snack on while you work, do something that keeps you happy and motivated as you tackle your home. And always keep in mind the results. When you have the goal in mind, you're sure to complete it! Now GO, start your home cleanse, and take time to feel good about any little bit of progress you make! 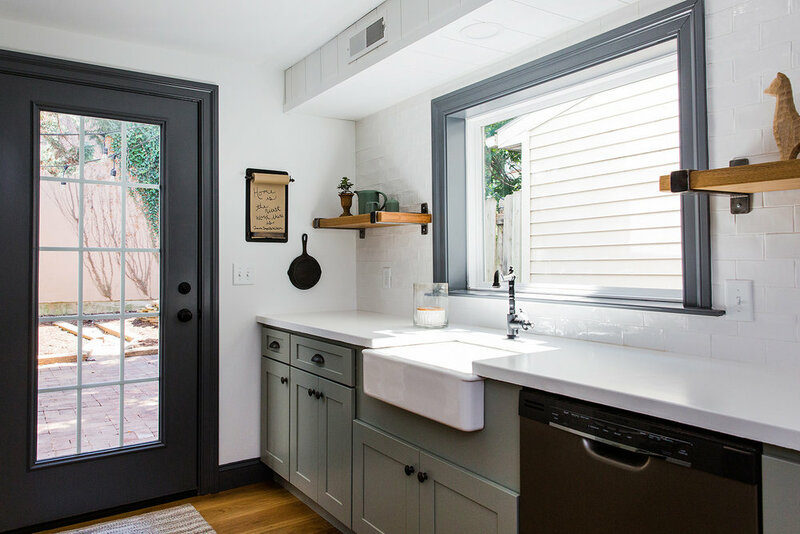 Our goal is for this blog to be more than just a place to share updates on Brentwood Builders, but also a source of helpful tips and welcome inspiration! Each month we will feature a product, home decor retailer, paint color, etc. as a part of our Daily Homemaking column. These posts may include giveaways, so stay tuned on our Facebook and Instagram pages. Today I want to share a brand of cleaning products that I cannot recommend enough. Not only does Mrs. Meyers Clean Day offer wonderful scents and branding that immediately draws you in, these products are "plant-derived" and use essential oils as part of their base. And they work. 1. 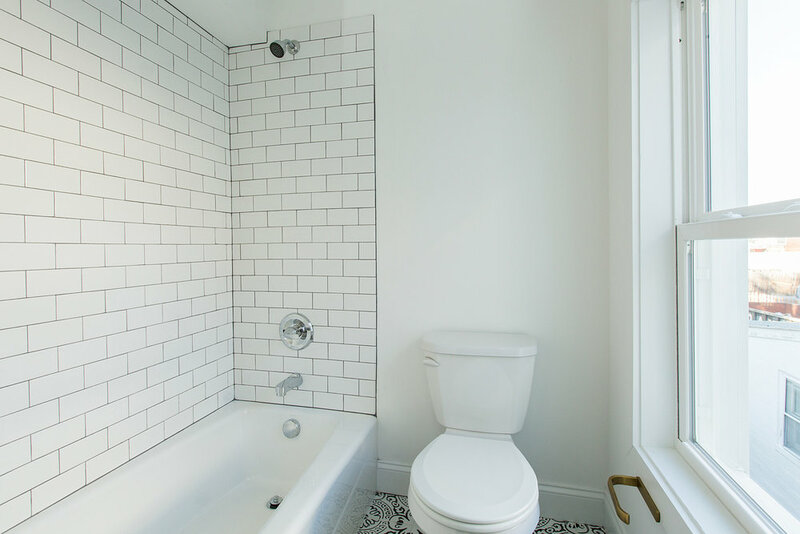 Tub and Tile: An organic product that actually does remove soap scum from the base of your bathtub in less than six washes. Seriously refreshing. 2. Multi-Surface Cleaner: My main go-to when it comes to any countertop or table surfaces in my home. A little bit of water and some of this spray goes a long way, and my kitchen smells amazing after I clean! 3. Hand Soap: Something about the branding of these products makes you feel perfectly OK to leave them sitting on your counters. 4. Dish Soap: The highlight of this dish soap, for me, is that it doesn't dry out my hands like some of the more chemically based brands do. 5. Candle: Because who doesn't like a a sweetly scented, soy candle in a cute jar? A $30.00 value of all our favorites! In order to enter, follow the instructions below. The giveaway will run through Sunday, February 7, and the winner will be announced on Monday, February 8 through our Facebook and Instagram accounts. For an additional entry, share this blog from our Facebook to yours. GOOD LUCK, and don't forget to run to Target for your own countertop spray! As we were working on the re-brand, we came up with all kinds of phrases to be the tag line for Brentwood Builders. At one point I proclaimed, "Let's build something together!" so sure that I had found the one, only to be reminded that this was Home Depot's slogan. So much for my brilliant idea. A phrase that I often use to describe things that I love is "things that feel like home." The feeling that I'm referring to is that warm and cozy, safe and familiar nostalgia that is evoked by "being home." Whether you're traveling back to your childhood home, or relaxing in the living room after a long day's work, chances are high that you feel comfortable and secure. And so the tag line was born. This is the feeling that we long for you to have as you walk into your Brentwood home for the very first time. We are a family business, therefore we believe strongly in family. We are builders of homes, therefore we believe strongly that our customers should feel completely at home. We are passionate about the craft, but also about the feeling. And we would like nothing more than to build your house to feel like home. We are so glad you're here! 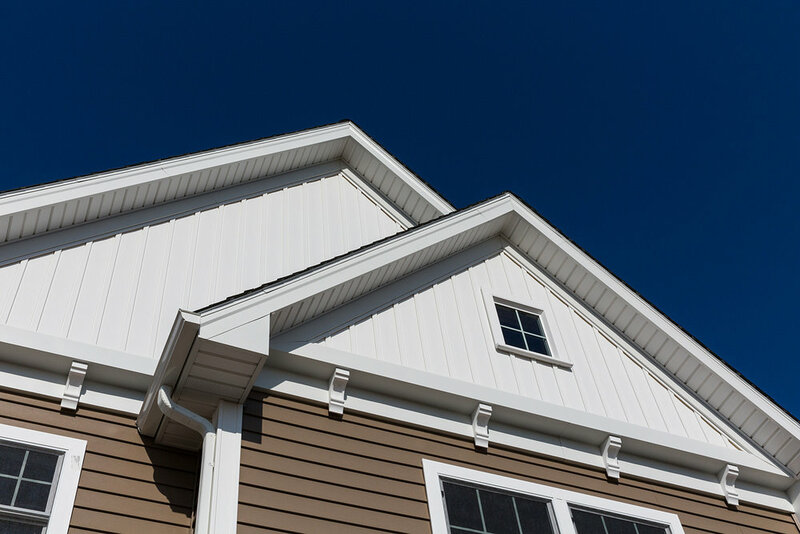 This blog will a place for you to gather information on the latest home trends, gain inspiration as you build a home of your own, and understand more of what we do here at Brentwood Builders. We invite you to follow along with our projects not only here, but also on Facebook and through following @brentwoodbuilders on Instagram! Stay tuned for more, and thank you for your support!